I hope that Lego and Carnegie Mellon are working together to get RopbotC 4.0 off and running. I would hate to think that the bottom line is the "the bottom line" and this might be the reason for the holdup. The people who get stuck in the middle are the students who are trying to further their education in robotics. I understand that businesses are created to make money, but I hope there are other considerations as well. With 30 sets of EV3's, my students want to build and program. They prefer RobotC to the Lego GUI. I am trying to hang in the virtual world right now but we will have to be going back to the Lego GUI later this spring. And now I just received an FTC notification that NXT is going to continue to be the brick platform for 2014/2015 competition. Our bricks are worn and I hate to think we are going to have to purchase more of those when they will be obsolete in one more year. Has anyone heard of either LEGO or FIRST offering some type of lease program for those who have already sunk their funds into the EV3? Could you explain why you think the "bottomline" is what is causing the hold up? Do you have insights that you'd like to share? I am curious because I am quite involved with the development of ROBOTC for EV3 and I am pretty sure that the things we are dealing with are not money related in any way. And now I just received an FTC notification that NXT is going to continue to be the brick platform for 2014/2015 competition. I must have missed it. Are you sure EV3 cannot be used in the 2014/2015 FTC competition? My understanding was RobotC is going to be released soon (like now). But since I haven't really heard a definitive release schedule, I am getting a little nervous about it. Our Mindstorms are zapped by static electricity for all past seasons and are now behaving funny (i.e. hung a lot). We had to use my personal brick for this FTC season. I don't know if our Mindstorms can last another season. And knowing that the Mindstorms are obsolete and replaced by EV3, we do not want to buy more Mindstorms. So if FTC is going back to Mindstorms for next season, we may have a big problem there. RobotC folks, care to comment please? Thanks. My "bottom line" observation is my opinion. As intelligent as personell are at both institutions (Lego and Carnegie), I find it hard to believe that implementing RobotC 4.0 has obstacles that appear to be insurmountable if everyone is playing nice with each other. I am not in any way, shape, or form a programmer compared to you or others, but I have enough years behind me and have been involved in enough situations that make me wonder if cooperation between the companies is at its best. If you are saying to me that it is, then great. So what are the issues? Is it the inability of the operating system to receive input from/ give output to the sensors/motors in a way that makes sense to the system? (Again, you are hearing this from someone who is a basic programmer - and I don't mean BASIC). Is it the fact that you are implementing a GUI along with the text programming? You might think - "It's not your concern", as to what it is. Perhaps not - but it would be nice to know that both LEGO and Carnegie are working together to solve whatever the issues are. Carnegie M. has been great to interact with and I appreciate what I have been able to do in the virtual world. I want to be able to take the students to the next level with live robots. And I would like FIRST to be able to say that EV3 will be available for the 2014/15 FTC season because if they don't, that will put our teams at a financial disadvantage if we have to purchase NXT bricks for one season. Thanks, hope this is enough of a reply for you. The following just came in a subscibed email from firstus.org.
. For the 2014-2015 season, the LEGO® MINDSTORMS® EV3 is not authorized for use in the FTC competition. Teams will continue to use the LEGO® MINDSTORMS® NXT, which will be available and supported by LEGO through 2015. Our goal at FTC is to make the LEGO EV3 available at a point in time when the rollout will be seamless for both Teams and Volunteers. Because of the diverse materials allowed in FTC, adequate time is needed to ensure the EV3 supports all allowed programming languages, sensors, motor controllers and that it works with the our Field Control System. Thank you for your continued patience and understanding as we evaluate this new technology. I don't know if this is cast in stone or if there is wiggle room, dependent on RobotC 4.0/EV3 progress. Does someone have an answer for that? Porting a programming environment to a brand new platform is not as easy as you may think, especially if it is heavily dependent on the VM provided by LEGO. Having said that, I do think LEGO and RobotC folks have not been communicating effectively. My understanding is that the RobotC folks were not involved during the development of the EV3. They didn't even have the hardware as of Jan 17, 2013 (viewtopic.php?f=14&t=5332&p=22468&hilit=EV3#p22468). To release a quality port of a platform, just testing would require more than 6 months. It also depends on how much resources the RobotC folks allocated on the project. Having said all that, I do wonder why the RobotC folks are not taking the advantage of the Linux platform with open source tools such as gcc and Eclipse. I suppose it's probably because they want to maintain a single code base across all different platforms (Mindstorms, Cortex, Arduino, PIC, etc), so they choose the route of VM abstraction. I can assure you that the necessary pressure is being applied on LEGO for things that are on their plate. The FTC issue is a little more complex than just LEGO and ROBOTC. Don't forget that FIRST needs to do a lot of testing before they release a platform for FTC. I have roughly 10 EV3s and more sensors and motors than you can shake a stick at, so I am not hurting for hardware (strangely enough, I only have 2 touch buttons). As for motor controllers and all that stuff, FIRST has kindly offered to send me whatever I may need, but I haven't taken them up on that offer yet. I have a motor and a servo controller for Tetrix and a motor controller for Matrix. Just no Tetrix motors. Quite a number of very big (and bad) bugs in the LEGO firmware (which we splice into) have been fixed by us and are being tested at the moment. My tasks have been focussed mainly on the low level device stuff and base operating system (Linux) and I've added quite a number of useful additional features that will greatly benefit people using the NXT sensors. You won't need to use Eclipse or vi or *shudder* Emacs. You can debug your program without needing to use gdb, which is Hell on Earth. Correction, gdb makes Hell look like a beautiful park on a spring day. You can use the same syntax on your VEX IQ as on your EV3, well, with the exception of the very platform specific calls, of course. Curriculum for EV3 will be largely the same as on NXT, makes it easier for teacher to transition to the new platform. Eclipse can be customized. For example, FRC is using Wind River which is a customized Eclipse with VxWork OS. 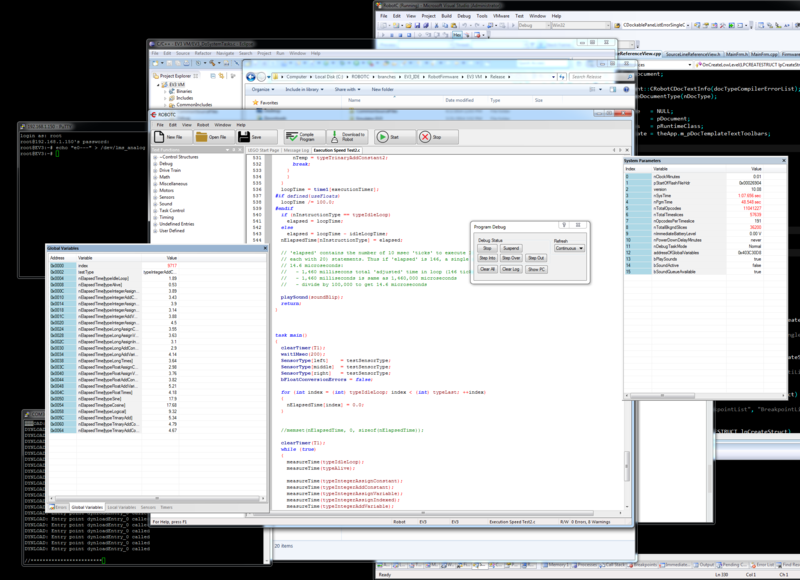 A lot of the Linux idiosyncrasies can be hidden by the IDE and the RobotC framework. So nobody needs to be aware of Linux underneath. I am not sure about FRC students being very advanced I am involved in both FTC and FRC. All the complex stuff in FRC are provided by WPI/NI (e.g. Vision processing). In fact, I think FRC programs are easier to write than FTC because FTC has a lot of autonomous (30 seconds) and FRC discourages autonomous (i.e. they only allow 10 seconds autonomous and you don't need to do much). Location: The plateau north of the Ohio River Valley, also known as Cave Country. That, in my opinion, is weird. Robots, by their name, were first meant to be autonomous. Why then would First Robotics Competition be involved in remote control and other non-autonomous stuff? At that point, a winning team would win because of its operator's skills, not its programming prowess. Please correct me if I am wrong. I don't know why FRC doesn't have more autonomous but my guess is that the robots are up to 120 lb and could be 5 ft tall. I guess they don't trust high school students to program autonomous on a robot this heavy. In FTC, robots do run away uncontrollably. But FTC robots are only 10 to 40 lbs. 120 lb robots running away may be too dangerous . The ROBOTC Virtual Machine.... it's.... ALIVE! Looks fantastic... My EV3 has been sitting here gathering dust. It wants the C.